Polly and Adam are each passing through the small town of Belleville, Delaware in the summer of 1995 and meet at a local bar. They don’t quite trust each other, but are irresistibly drawn to each other. Polly hadn’t planned on sticking around long, but ends up getting a job and a renting a small apartment in town. She and Adam get more and more involved, but still aren’t completely honest with each other. Adam isn’t sure if Polly is an innocent victim or a dangerous schemer. The days go by quickly and as summer draws to a close, it looks like the explosive secrets both Polly and Adam are keeping could end up blowing up their relationship and maybe even putting their lives in jeopardy. I’m a fan of Laura Lippman’s Tess Monaghan series, and those books are more traditional mysteries. 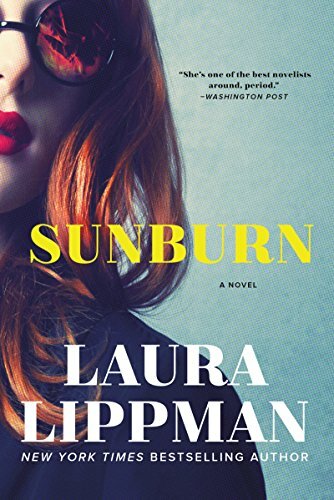 Each of her standalone novels is very different from the Monaghan books, but Sunburn is especially unique. Descriptions of the book say it was inspired by 1940s noir crime novels, and there is a nostalgic feel to the book and an atmosphere of impending danger. I was pulled into the story from the first chapter and once I started, I didn’t want to put it down. It’s apparent from the beginning that Polly is a woman with secrets, but it’s not as clear what type of person she really is. Adam seems like the ultimate good guy, but he is also hiding his motives for initially approaching Polly at the bar. The book is fast-paced and keep you guessing as to what will happen next and glued to the pages to find out. In many other recent suspense novels I’ve read, the main character first appears to be a good person. However after their secrets are revealed, the reader begins to have doubts. This novel is different in that to start out with, Polly is an unsympathetic character who appears to be an uncaring mother and a user of men. However, as Polly’s secrets begin to unfold, it’s not as clear-cut as to whether she’s a good or bad person, and I began to admire her courage, even though the way she deals with things can be hard to relate to. By the end of the book, the reader is better able sort out the truth from the lies. Although the ending can’t be strictly called “happy”, it is a fitting, satisfying ending to this outstanding novel of psychological suspense. This is in my Amazon shopping list. Sounds really good. Nice review! I’ll be getting this book at an author meet and greet in a few weeks–can’t wait.